Gray Nursery Ideas and Gray Crib Bedding by New Arrivals! 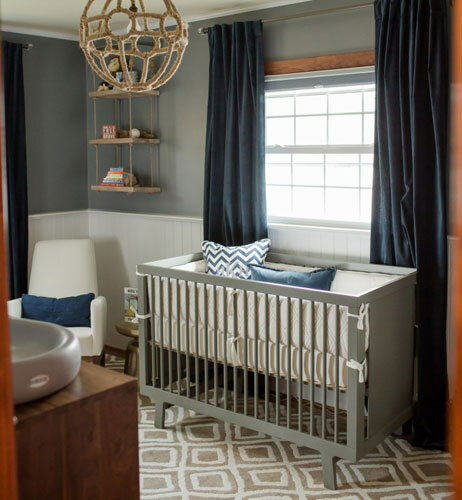 Gray is one of the most popular colors used in nursery design. Not only is gray an amazing gender neutral shade, but it can also be very versatile. Pair gray with other soft or bright colors. Soft pink, hot pink, aqua, coral, yellow and navy all coordinate well with different shades of gray. 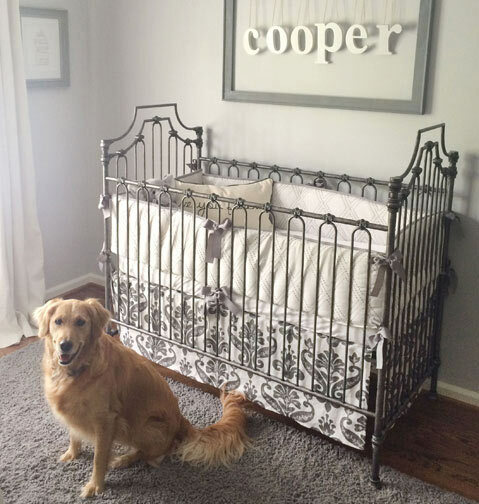 We are sharing some of our favorite customer nurseries that feature some of our top selling gray crib bedding collections. Gray can give a look of elegance when paired with soft pink. This pink and gray baby room is breathtaking, and features our Stella Gray Baby Bedding Collection, one of our top selling gray crib bedding sets for girls. The diamond patterned wall and elegant chandelier give the room a traditional look with a twist. 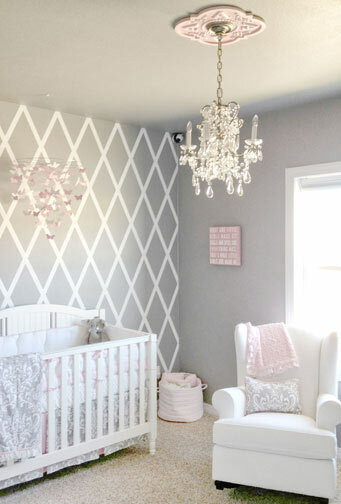 Pink and gray together can also work for a modern girl's nursery. These same shades in a chevron pattern give this room a completely different look. The gray walls with tree wall decal are a sweet backdrop for our Peace, Love & Pink Baby Bedding Collection (no longer available). Our Park Place in Pewter damask fabric in different shades of gray creates a stylish nursery with a classic feel. Our Park Place Baby Bedding Collection (no longer available) can work for a boy or girl. Nautical themed nurseries don't always have to feature blue and bright red. This sophisticated boy nursery puts an unconventional twist on a classic theme. Gray mixes perfectly in this room with navy and khaki colors. Our Chevron Baby in gray crib bedding is one of our top selling collections. Pop in another color with pillows, rug or other room decor items. 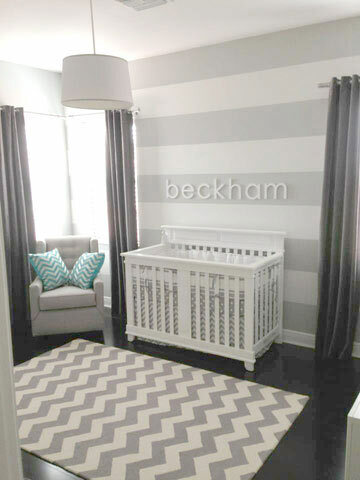 This nursery for Beckham adds in some aqua pillows to give the room some extra color. The same Chevron Baby bedding is used in the nursery below, but creates a completely different feel by adding in the nautical wall decor. What is your favorite color to pair with gray? Need more gray nursery inspiration? 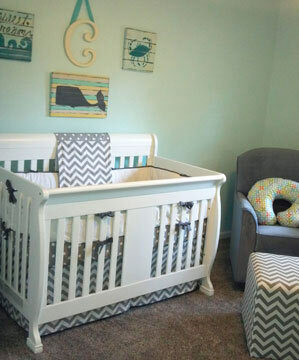 Check out our Gray Baby Room board on Pinterest!